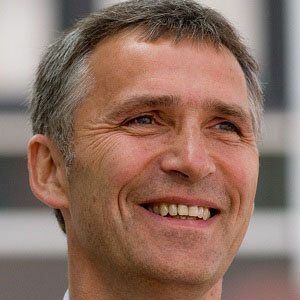 From 2005 until 2013, this Labour Party leader served as Prime Minister of Norway. In late 2014, he took office as Secretary General of the North Atlantic Treaty Organization. After earning a degree in economics from the University of Oslo, he participated in several Vietnam War-era protests and went on to lead the Norwegian Labour Party's Workers' Youth League and to work for a company called Statistics Norway and for a publication titled Arbeiderbladet. During the 1990s, he served as Norway's Minister of Industry and Energy and Minister of Finance. The son of politicians Thorvald and Karin Stoltenberg and the brother of Norwegian Institute of Public Health Director Camilla Stoltenberg and television personality Nini Stoltenberg, he was born and raised in Oslo, Norway. His marriage to diplomat Ingrid Schulerud resulted in children named Axel and Anne Catherina. Conservative Party leader Erna Solberg succeeded him as Prime Minister of Norway.